Thanks to our generous supporters and dedicated volunteers, the Emory University Herbarium has successfully digitized over 20,000 herbarium specimens, the oldest of which dating back to 1872! View the full Scientific Program HERE! This event is free and open to the public! Join us in celebrating this milestone! Parking: The closest visitor parking deck is located at the Peavine Lot. We have an exciting lineup of speakers and posters for this event! Examples of items for raffle include botanical artwork, herbarium t-shirts, special seed collections, gardening tools, and etc. 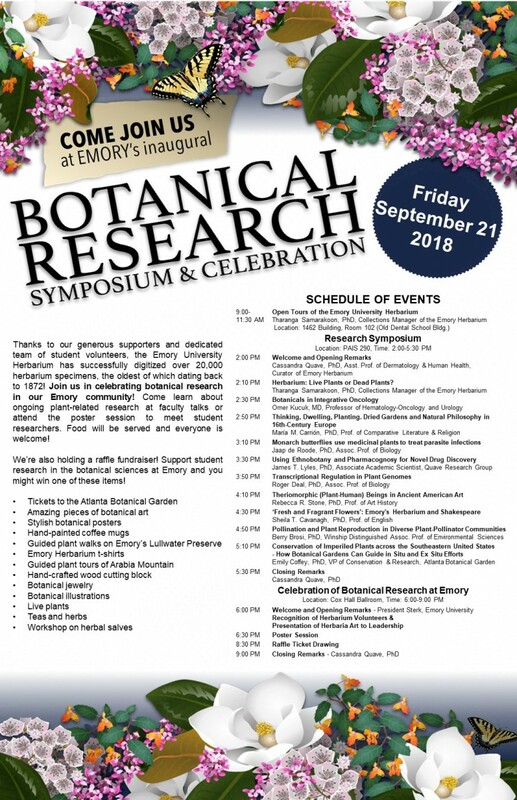 All proceeds will be deposited in the giving account during the event to support student research in the botanical sciences with the Herbarium collection at Emory University. More details coming soon! We hope to see you there!